In our Expat Interview series, we talk to expats all over the world who are involved in doing something which our readers would be interested in hearing more about. It could be work, running a business, or involvement with a charity. We’re making a departure for this interview as our interviewee isn’t an expat. However, he has what we call the “laptop lifestyle” – he can work from wherever in the world he chooses. And that is something many expats aspire to! Today’s interviewee is Steve Bright, a British citizen and one of Britain’s top cartoonists. 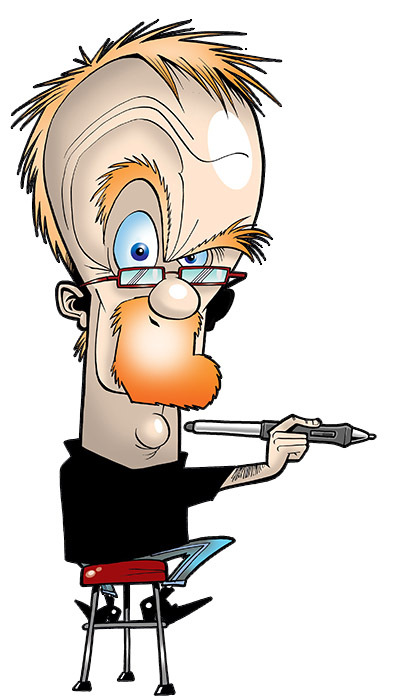 Steve Bright (pen name: ‘Brighty’) has been a full-time professional freelance cartoonist since 1983, working for numerous publications and clients over the years. Prior to that, he joined D.C. Thomson & Co. Ltd straight from school, with the intention of pursuing a career in journalism, only to find himself on the editorial staff of The Beano , writing weekly scripts for characters such as Billy Whizz and Biffo the Bear. After a meteoric rise, he was moved to assist in the creation of Nutty comic where, aged 19, he was responsible for creating and writing ‘Bananaman’, which subsequently went on to become an animated television series, and is set to become a big screen live action movie later this year. After six years, he took the plunge into the freelance world, using his first love of drawing, along with the experience of those years. He has been there ever since, producing cartoon work for a myriad of publications from The Beano and The Dandy , to The Sunday Times , plus others too numerous to mention, and as diverse as you could imagine. Currently, he is the editorial cartoonist for the UK’s best-selling newspaper, The Sun . Glasgow-born, Steve spent most of his life in and around Perth in Scotland, before moving south of the border in 2002. He is a member of the Professional Cartoonists’ Organisation. British Expat: How did you get into the enviable position of being able to work from where you choose? Did changing technology gradually enable this or was it a sudden leap after you decided that this was what you wanted to do? Steve Bright: Initially, technology had no bearing on it whatsoever. I left an office job to pursue a freelance career as a cartoonist. My only real option was to work from home, so I bought a draughtsman’s drawing board and began drawing with nib pens and ink, pretty much the same tools that had been used by cartoonists for at least a century. The most ‘high tech‘ instrument I worked with was an automatic pencil which saved time on sharpening. Other than that, I drew on paper or Bristol Board and delivered my work as original artwork to the editors, either in person or by post. That was how it was done for at least the first ten years, before technology began creeping into my working practices, initially with a fax machine, before computers took over, and eventually I arrived at my current modus operandi, with no paper involved, all artwork produced digitally from start to finish, and electronic delivery via email; the stuff of science fiction when I first started out. These days, using a portable Wacom Cintiq graphics tablet and a laptop PC, I can literally carry my entire office in a backpack, and work from anywhere in the world with a decent Internet access and a couple of electric power sockets. If you didn’t live where you are now, where in the world would you choose to live? Almost certainly back in my native Scotland, though probably higher up than Perthshire, among the mountains and lochs. If I had only myself to think about, possibly Austria, Switzerland or Bavaria, surrounded by Alps. Mountains are hugely important – I don‘t do flat so well. Does this way of working lead to a lonely existence? Of course there are several ways to socialise online, eg various forums where like-minded people can chat and discuss things. Is this something which you find helpful or perhaps you’re glad of the solitude during working hours? I’m not sure I’d describe it as lonely, but certainly my working life has lengthy periods of isolation. However, I’ve long since become accustomed to my own company, and I think I’d take badly to working any other way now. I’m far from a recluse though, and enjoy the company of both my family and friends when I’m not drawing. I’ve never lived alone, and rarely thought of it as an attractive prospect (we all have our moments, of course). I’m happy to admit that I’d be lost without the Internet these days, however. After so many years of just the radio for company (telly is too distracting), excellent though it is, I love that I can down tools every now and then and instantly communicate with others all around the globe via social media and various forums. It can sometimes eat up too much of your time, and you need to be disciplined, but as just one of its many uses in my life, the Internet is the most marvellous communications device ever, and perfect for busting the solitude when needed. Do you travel a lot? Does your laptop go everywhere with you? What’s on your “must pack” list? Abroad, no; my last passport expired in 2005, and it had only been used once, ten years earlier. One of the curses of self-employment is the real price of taking time off. You don‘t get paid holidays, so they effectively cost double when lost earnings are thrown in. But I’ve never really had that Wanderlust anyway. I do enjoy weeks in and around the UK though, when we get the chance. But I hate the build-up, packing, travelling, and coming home again. The sooner they invent the Teleporter, the better, as far as I’m concerned. But once I’m there, I do enjoy getting out and exploring – my idea of Hell on Earth would be a week or two spent on a beach doing nothing. Mostly, we head for Scotland. I have what used to be known as a ‘timeshare‘ week in Aviemore, overlooked by the magnificent Cairngorms. And yes, the laptop goes with me, along with the Cintiq, my iPad and mobile phone. That’s it for the “must pack“ list though – everything else can be replaced if it’s forgotten. If I ever retire, travel abroad may play a bigger part in my life… but I’ve also said that about gardening, and I can‘t see that happening either. Or retirement…hopefully! This entry was posted	on Thursday 12 March 2015 at 08:23	and is filed under Expat Interviews. You can follow any responses to this entry through the RSS 2.0 feed. You can leave a response, or trackback from your own site.